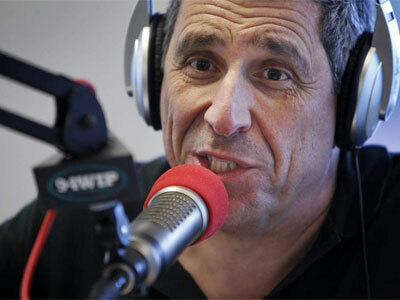 Philadelphia, PA – Several attendees of the Cataldi family weekly Eagles party confirmed yesterday that a sheepish Angelo Cataldi attempted to change back into a Sam Bradford jersey he had enthusiastically shed after the first quarter of the Eagles games Sunday afternoon. Reports claim Cataldi began the game in his Bradford jersey, but threatened to remove the garment after Bradford’s first interception was thrown on the Eagles second possession of the game. After Bradford’s second red zone interception before the end of the first quarter, Cataldi reportedly made a “huge deal” about how he “was finished with Bradford” and stomped upstairs to his bedroom. When he returned, he was wearing a Mark Sanchez jersey and vociferously began calling for Bradford’s benching. “He stinks! Chip will lose the locker room if he doesn’t take this bum out of the game. It’s going to be a long Eagles season if this nonsense keeps going on, it’s just a disgrace the way this once beloved team is being run into the ground by a head coach who has no idea what he’s doing, whom I did not like since his hiring,” Cataldi said, as party goers tried to tun him out. However, after Bradford turned his play around and took control of the team, eyewitnesses reported that he quietly got up from his sofa, retreated upstairs, and returned downstairs with his Bradford jersey back on. “That is a great throw Sam, great throw! He looks pretty great!” Cataldi said, on the edge of his seat.